The annual DEEP Indonesia International Underwater Photo Competition has grown to be one of the most prestigious and competitive of its kind. As part of the Underwater Competition Series, the contest is organized by DivePhotoGuide and Wetpixel. This year’s competition received thousands of entries vying for the chance to win more than $45,000 in travel and equipment prizes. Congratulations to Grant Thomas, who took home the Best of Show award for an impressive split shot titled “Papuan Sunset.” This image, and all the other winning photos, can be viewed right here on UnderwaterCompetition.com, as well as at the DEEP Indonesia Expo in Jakarta, Indonesia. Thanks again to our talented judging panel, Aaron Wong, Christian Vizl, Burt Jones and Maurine Shimlock, Adam Hanlon and Andrew Marriott. As with all Underwater Competition contests, 15% of proceeds will be donated directly to marine conservation efforts. "SOS, Arca calling for help, SOS..."
"I have got my eye on you"
"Gardens of the Queen, panoramic image"
"Deep Lights, light painting during night dive"
Location: Adams River.British Columbia, Canada. "All along the watch tower"
Any image where the lower portion is underwater and the upper portion is above water. Splits, aka half-and-halfs, will be judged on the merits of the picture as a whole. Adam Hanlon is an underwater photographer captivated with the challenge and beauty of the underwater world and passionate about its conservation. His images and reports have won international competitions and been used in prestigious publications and by world-renowned organizations worldwide. He grew up in the bush in South Africa, holds an arts degree, and has been taking pictures and shooting video underwater since the mid-1980s, and has been pursuing a career "beneath the surface" ever since. 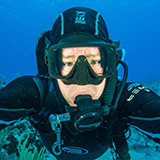 Now resident in the UK, he is the editor of Wetpixel, one of the world’s leading resources on all things underwater imaging, and through Wetpixel Expeditions, Adam leads regular photography expeditions and workshops around the world.